The massive outpouring of consumer products available today might alone lead one to ask How much is enough? But at the same time, if we allow ourselves to see the social, political, economic and environmental consequences of the system that produces such a mass of “goods,” then the question is not simply a matter of oneâ€™s own personal choice, but points to the profound interconnectedness of our day to day decisions about How much is enough? The ease with which we can acquire massive quantities of food, clothing, kitchenware, and various electronic goods directly connects each of us with not only environmental degradation caused by strip mining in West Virginia, and with sweat shops and child labor in India or Africa, but also with the ongoing financial volatility of Western capitalist economies, and the increasing discrepancies of wealth in all countries. This interconnectedness is the human environment, a phrase intended to point toward the deep interconnection between the immediacy of our own lives, including the question of How much is enough?, and both the social and natural worlds around us. This collection brings together essays from an international conference jointly sponsored by Ryukoku University, Kyoto, and the Institute of Buddhist Studies, Berkeley. The effects of our own decisions and actions on the human environment is examined from several different perspectives, all informed by Buddhist thought. 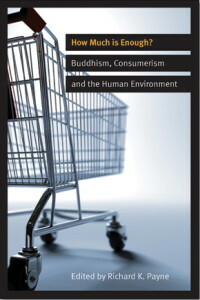 The contributors are all simultaneously Buddhist scholars, practitioners and activistsâ€”thus the collection is not simply a conversation between these differing perspectives, but rather demonstrates the integral unity of theory and practice for Buddhism. Learn more or purchase the book directly from the Wisdom Publications website.